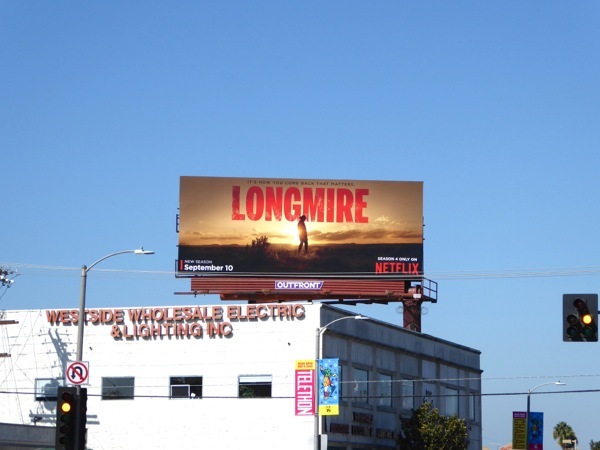 People seemed to freak out when they heard that Netflix wasn't renewing its selection of movies provided by Epix and they were signing with Hulu instead, but Netflix say they want to be able to offer subscribers to their streaming service exclusive original content, like for instance the fourth season of Longmire, which was cancelled by A&E Network after three seasons, but has been brought back to life on Netflix. 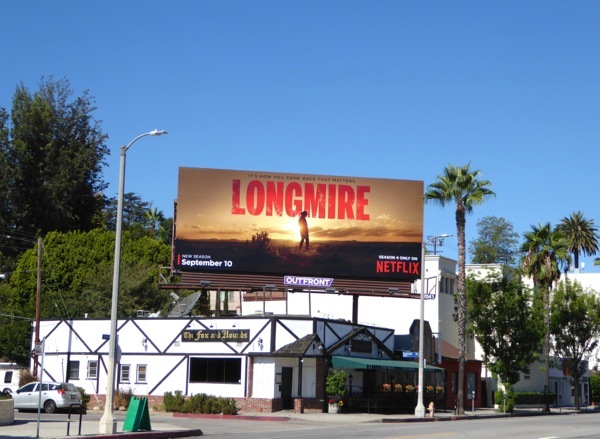 The Western drama which is based on Craig Johnson's 'Walt Longmire Mysteries' novels will immediately continue the action from the season three finale, with country sheriff 'Walt' (Robert Taylor) finally having discovered his wife's killer. 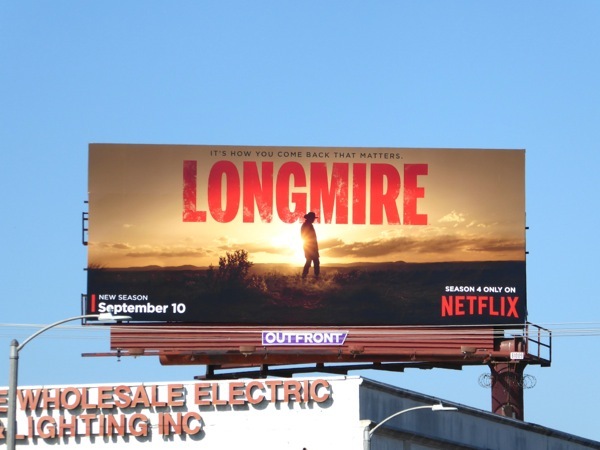 Get ready to binge-watch all ten episodes of the new season to find out who lives and who dies, and keep your fingers crossed for a fifth season if viewing figures are good. 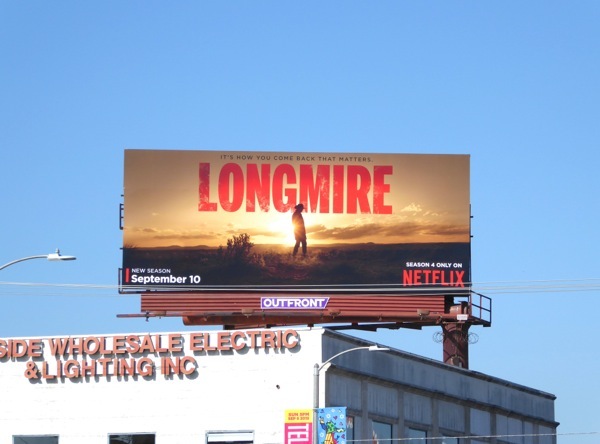 These spectacular Longmire season four billboards, that really is a beautiful image which captures the spirit of the series, were snapped along La Brea Avenue on September 6, 2015, and the next day along Ventura Boulevard in Studio City. 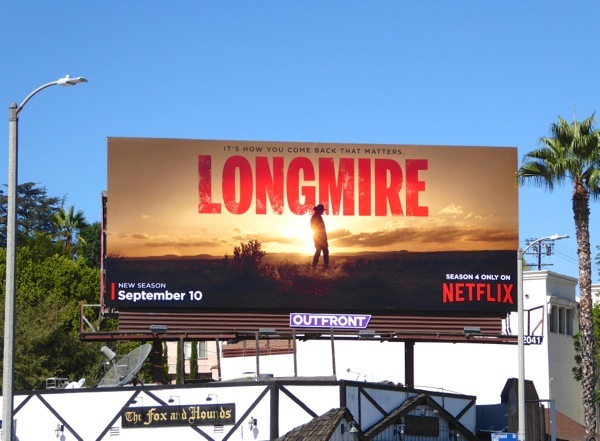 If you're a fan of the show, be sure to check out these previous season promo billboards for Longmire. And remember, 'it's not how you come back that matters', just that you do.